No, this is not another sheet-mask-toner-BB-cream post. Korean cosmetics are a lot more varied than that, as you will find out. What is so great about Korean cosmetics, you ask? For starters, most products really do what they say. Secondly, their multi-step skin care regimen is responsible for their baby-soft, dewy skin - do they even age? And, this I quote from Marie Claire: "The R&D is 12 years ahead the rest of the world" and they know what to do with many ingredients the rest of the world has not even considered for skincare. Having used Korean skincare products for more than a year now, I agree with all three. One of my favourite websites to shop for Korean cosmetics is Jolse.com - they ship worldwide for free (just $2.50 extra worldwide if tracked) and will deliver expedited during the Holiday season, so if you are looking for last-minute treats, you are in the right place. There are little extra GWPs with every purchase PLUS there is a discount running on most products right until Christmas Day! Korean cosmetics. The phrase generally screams BB cream, lip tint, skin essence and sheet mask. Problems with those choices are, shade matching for BB creams, skin type matching for essence and, well, a sheet mask as a Crimbo prezzie? For the beauty bargain/gift-hunter, the Korean cosmetics industry boasts of a dazzling array of nail, hair and foot care products of equally good quality. Which is why this posts focuses on some of them. Check out my Holiday 2014 gift guide for Korean cosmetics from Jolse.com for beauty and nail polish fans. An ideal, inexpensive stocking stuffer for the glitter lover. This is the Korean version of O.P.I. 's Glitter-Off peelable base coat. Glitter polish is such a pain to get off, unless you spend all the time in the loo picking at your nails, glitter by glitter (who else has done this?). This base coat peels off completely, bringing the glitter polish with it. 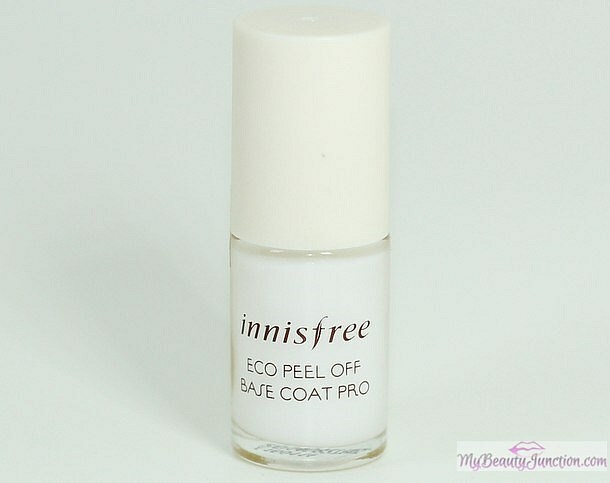 Innisfree's base is five-free and the brand is all-natural, though I have no idea how you make "natural base coat". Buy it here. All gel polish fans will love this! 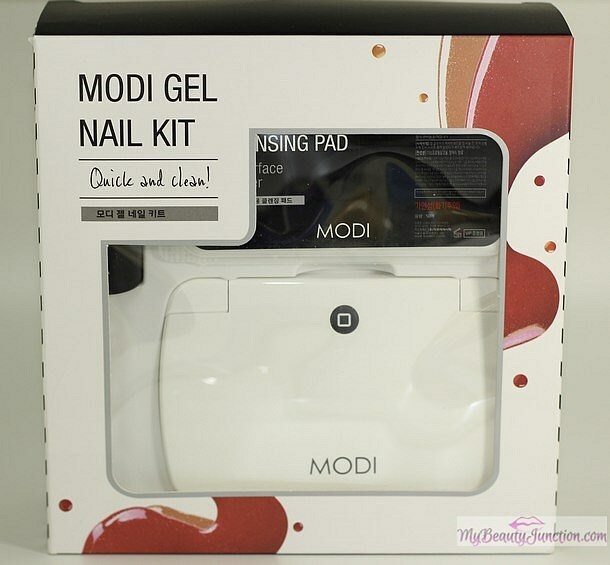 The lamp itself is very compact and there is also a cleansing set to prep nails beforehand, and a gel coat polish. I have been looking for a decent gel curing lamp but the prices were a put-off. This one is affordable at $64 and is made in Korea. I will give it a whirl once the Holiday season is over and there is time to sit down. Buy it here. A life-saver. All my OPI Shatter polishes have dried up. And, would you believe I paid $22 each for them? Singapore dollars, not USD, but still! I would love to be able to salvage them with this. It costs just $5.26 now and you only need two or three drops to salvage a bottle of polish. Look out for a review. Buy it here. Having the frizziest, dry, damaged hair, I am always looking for products that will give it some TLC. This is a rich spray-on conditioner that you apply after shampooing and rinse off after a few minutes of detangling. It is supposed to provide intense hydration and make it easier to detangle the hair. I have the most tangled hair on the planet - bird's nest, more like - and will definitely appreciate something like this. Buy it here. My hair is naturally on the straighter side, but poufs up - blame the extreme humidity here - without some help. I love home straightening treatments and have never had straightening/rebonding done in a salon. I used to apply the Schwarzkopf Glatt and Wella kits at home regularly. I have never tried a Korean straightening kit before, but am due for a treatment in early 2015, so I will be able to tell you more about this at the time. Buy it here. For those leery of gel polishes and curing, and unable to get their hands on Sally Hansen Miracle Gels, this topcoat gives every polish a gel effect. An ideal stocking stuffer for just $4.82. Buy it here. How pretty is this going to look? 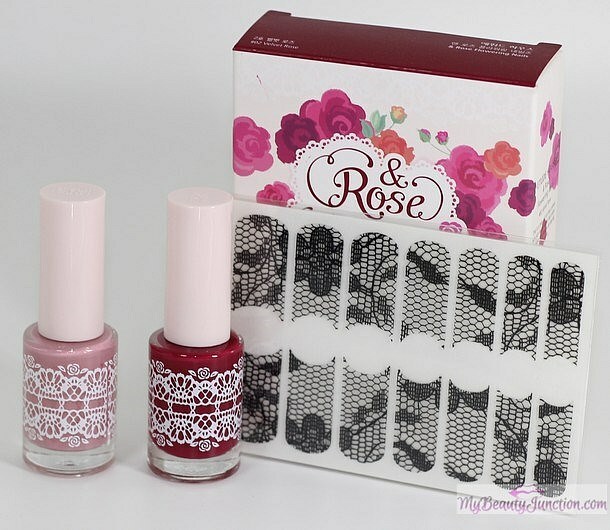 For $7.02, this gorgeous kit contains two rosy nail polishes - one of which is the perfect matte dusty rose - and two sets of lace transfers, which you can place over semi-dry polish and trim away. This is going to be my New Year's Eve mani. I will wear the other colour for Valentine's Day. Perfect! Buy it here. 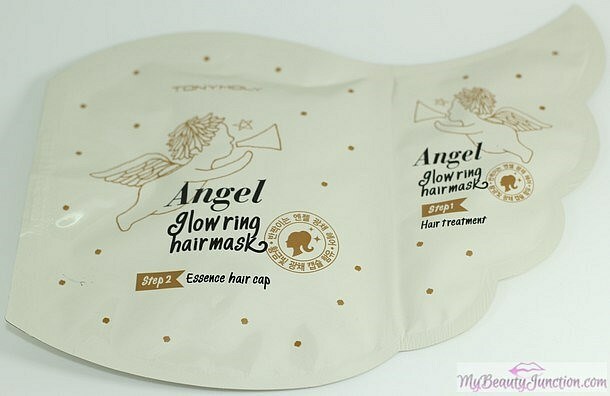 This is a one-time use "sheet mask" for the hair. It contains an intensive nourishing hair serum and a cap to seal in the serum. You apply the treatment part on the hair and wear the cap, and leave it on for a while, maybe heating up with a towel. Containing argan tree kernel oil, royal jelly and honey extracts, this mask is meant to provide a hot-steam effect on dry, damaged hair. Years of sulphate-washing daily with no conditioning have made my hair straw-like, so I hope this soothes my poor locks. Buy it here for $4.69. My favourite kind of foot mask. I have tried the Holika Holika Baby Silky Foot Mask and loved it, but always thought it needed some fastening as it would invariably slip off my feet at night. This version comes with tape attached to the socks and is just $4.38 apiece. I use these masks every 10 days or so and find I don't even have to do a pedicure or apply foot cream every day. Wonderful stuff! Full review coming up soon. Buy it here. While not falling into the Korean stereotype of BB and CC creams, lip gradient tints, essences and sheet masks, these beauty products make inexpensive Christmas treat for yourself or for a nail polish fan, beauty addict or just a lovely person in your life. You will be surprised by the quality of nail products, foot care and hair masks - I know I am getting myself half a dozen nail polishes from Etude House, Missha and Innisfree soon. Worldwide postage with tracking is just $2.5, and it is free for orders above $40. Free non-tracked postage is applicable to all orders. Best of all, you get $3 credit when you sign up. And, you get three samples with every purchase and the quantity goes up in proportion to your order. Customer care is very good and any issues you may have with postage are quickly taken care of. I have only showcased some not-so-stereotyped Korean beauty products here; there is so much to look at on Jolse.com, and there is a discount valid right until Christmas! Brands such as Goodal, Innisfree and Nature Republic are natural and there are plenty of organic choices. Best of all, Jolse has English descriptions of everything. Do check out the site before the discount is over, and have a beautiful Christmas! Prices mentioned are applicable at the time of writing this post. Discounted rates may not be available after Christmas. PR samples sent for review.